With the common name of pansy orchids, Miltoniopsis are often mistaken for Miltonia, however a difference does exist. Its all about the pseudobulb and where the leaves grow from. So at the top of the pseudobulb, Miltoniopsis have one leaf, Miltomia have two. That is not the only difference, however its enough to give them a different name. These are an orchid that like medium to low filtered light, they like medium humidity and good air circulation. Generally grown in mixture of finely pulverised orchid bark along with perlite for drainage, any similar mix will suit. They do not like nighttime temperatures lower than 10c (50f) and at this extreme prefer to be a little on the dry side. 15c (60f) is a more suitable minimum. A daytime max of 25c (80f) is ideal. So if you can control the temperature, these are a wonderful, and reasonably easy care orchid. Medium to Low filtered light at all times. Night no lower than 10c (50f) – Daytime max of 25c (80f). Fine orchid bark that drains well yet retains some moisture. 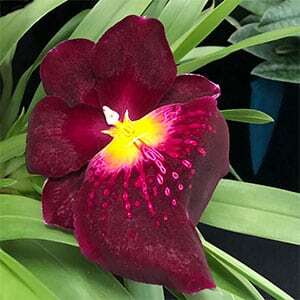 Miltoniopsis Crimson Cascade is a hybrid, a beautiful waterfall pattern on flowers that will last for 5 – 8 weeks.